The Castle Lake Environmental Research and Education Program (CLLRP) was established in 1959. In the following five decades the program has continued uninterrupted, creating the longest running, mountain lake research and training program in North and South America. Global climate change has become a growing concern for plant, animal, and human living conditions. While lakes act as sentinels, providing signals that reflect the influence of climate change in their broader catchments (Williamson et al. 2008; Williamson et al. 2009), little empirical research exists on aquatic productivity in response to long-term disturbances from global warming or other more direct perturbations (e.g. introduction of fishes). The station’s >53 year data set offers a rare opportunity to explore long-term patterns in climate forcing, and based on those and regional climate trends, model a range of response scenarios. The Aquatic Ecosystems Analysis Laboratory (AEAL) will hire 3 undergraduate researchers ($10/hr) to work at Castle Station (June 1 - Aug 22) and on weekends from Aug 29-Sept 28 to assist in the collection of ecological information from the lake and watershed. Students with a background in upper-division courses in water science are preferred applicants. This is an amazing way to receive field and ecological experiences in a short period of time and students are expected to engage in all activities related to the laboratory. 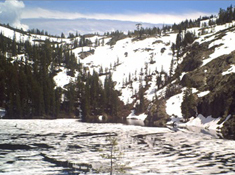 You can expect to work on a wide variety of lake research projects, including outdoor field work and indoor lab work. Some examples of duties are listed below. 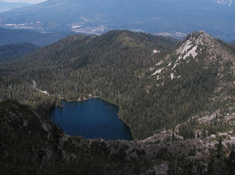 The Castle Lake Research Station is located in the Siskyou mountain range, just 20 min from the town of Mt. Shasta, CA. While living at Castle Lake, you will be tent camping but will also have access to indoor storage, a stove, and a refrigerator. The cabin (900 sq ft) is mostly used as a laboratory space, but it also has a nice kitchen, with a table; and a small lounge area near the wood stove. There is limited internet connection and all staff reside on site in tent camps and share food and cooking responsibilities. 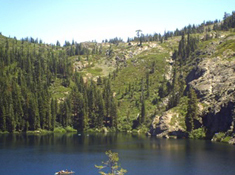 When camping at Castle Lake, you should be prepared for cold and warm weather, as the lake is 5400 ft above sea level. Also be prepared for a beautiful view of Mt. Shasta, nightly stargazing, and an opportunity for a daily swim! For more information please contact, Dr. Sudeep Chandra, limnosudeep@me.com, 775-354-4849. To apply for these positions please email a resume and letter of recommendation to Dr. Sudeep Chandra by March, 31st, 2014.